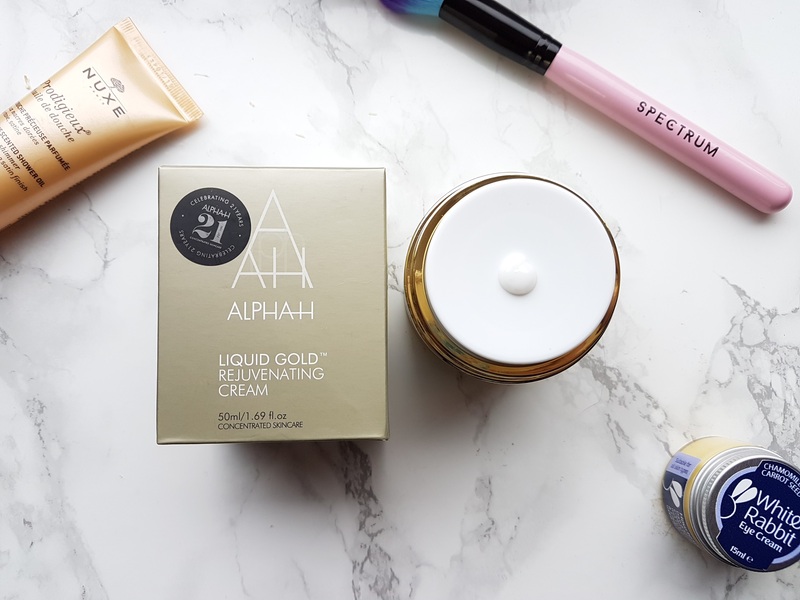 I recently received this ‘Alpha H Liquid Gold Rejuvenating Cream’ 50ml pot from a blogger event that I went to called #LivHelps. This beauty was in the goody bag! I have heard of ‘Liquid Gold’ before and I have always wanted to try it. Who knew there was a moisturiser version! I didn’t. I was so excited when I found this in the goody bag I had to start using it that night. Alpha H Liquid Gold is a concentrated skin care product and it says that it is best suited for ‘normal skin’ (which means it’s suitable for everyone) and ‘mature’ skin. I always find that when something says mature it puts a lot of younger people off as they think it means for people 40+! Well this really isn’t the case Technically we have ‘mature’ skin from the age of 25 (sorry), but this does not mean you are old! It is just that your skin is classed as mature and yes unfortunately will start to age. This is the best time to start using anti-ageing products. It is ‘ANTI’ ageing not ‘reverse all wrinkles’ cream, so you want to use it before your skin shows any signs of ageing as these products will help prevent fine lines and wrinkles, meaning your skin will look younger for longer! The Alpha H Liquid Gold Rejuvenating Cream’s key ingredients are: 5% Glycolic Acid, Album Bark, Argan Stem Cells, Vitamin C and Matrixryl 6. Argan Stem Cells help to protect and enhance your skin, whilst the Vitamin C helps to firm and brighten your skin. The 5% Glycolic Acid works as an exfoliater because it has high acidity and has easy solubility. It goes under the damaged layers of skin and assists in shifting the dead skin cells. This means smoother skin and a youthful appearance. Removing the dead skin cell build up helps decongest the skin, encourage cellular renewal and minimises the appearance of pigmentation. Once you apply the moisturiser you may feel a tingling sensation, this is completely normal. This happens due to the low pH of the Glycolic Acid and means it delivers fast and effective results. When using Glycolic Acid products it is very important to wear an SPF as because it removes the layers of dead skin it makes your skin more sensitive to the sun. It is important to wear an SPF everyday on your face regardless though. I am really made up with this product, it doesn’t tingle too much but you can definitely tell that it is working. It absorbs nicely into the skin and leaves my skin feeling soft and smooth. I usually have some break outs but since using this my skin is clear in just a week! Any problem areas I did have, have now disappeared. This really does live up to the name of ‘Liquid Gold’ it is amazing. It should be though seeing as this 50ml pot costs around £51! Not something I would want to pay unless it truly does work, which thankfully it does. I will now see how long this pot actually lasts. I can usually get around 6 months from a pot this size. This is an investment and not something you would want to fork out this amount of money for regularly. I will keep using this every night, and I would definitely consider purchasing this once I have used it all! This gets a big ‘thumbs up’ from me! Have you tried this moisturiser or anything from their Liquid Gold range? Or have you been considering getting this product? Please let me know, I would love to hear your thoughts.